For the week ending November 21 the DOL reported that the number of initial claims for unemployment benefits declined by 35,000 to 466,000. Although this decrease is good news the jobloss recovery will probably continue because the level of new claims typically must be below 400,000 to result in payroll growth - the labor force always has a natural churn of hundreds of thousands of new claims every week. Based on a chart provided by Mark Gongloff there should be a payroll change of minus 40,000 jobs associated with this new initial claims figure. Now to turn our economy around we need in the words of Ayn Rand "a separation of economics & state." What we have is illustrated in the graph above prepared on January 9, 2009 by Christina Romer (BO's Head of the Council of Economic Advisers) & Jared Bernstein (Chief Economist and Economic Policy Adviser to Biden) to show the expected effect of the Stimulus on the unemployment rate - the actual unemployment rate is also shown for comparison. 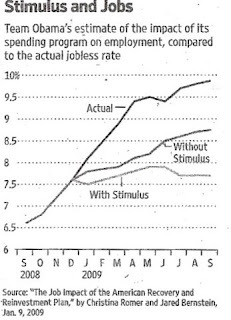 Romer & Bernstein were tasked to develop BO's plan to recover from the 2008 recession & they both certainly bought into the Stimulus 100 percent. It should be noted that although Romer has academic economic credentials Bernstein is considered to represent a progressive pro-labor perspective - he has degrees in Fine Arts (Music), Social Work, Philosophy, & Social Welfare. A separation of economics & state would unleash the free enterprise capitalistic system to create wealth without the encumbrance of government interference which is the menace that is the root cause of our unemployment problem. Fred Charette writes "only entrepreneurs create jobs by risking career & capital to start & build businesses that employ people to make useful things & provide needed services. By contrast, the government & the unions destroy jobs." But go a step farther to understand why we need unfettered free enterprise: Bill Burbage writes - "no entrepreneur has ever had the objective of 'creating jobs'. (In fact) they constantly seek to eliminate jobs. People go into business to make a profit. If any jobs are created in the process there is no way to avoid it. To create more jobs, the sovereign must remove as many obstacles as he can between the entrepreneur & his ability to make a profit. No other stimulus is necessary. Instead of eliminating the obstacles that already exist, we are preparing to pile on even more with the carbon tax & healthcare reform." Now with regard to the carbon tax, healthcare reform & all of BO's other socialist programs Curtis F. Von Der Ahe writes - "hiring will not pick up until the full effects of cap & trade, healthcare reform, pro-labor laws, & new taxes are known. Unfortunately, once they are known, hiring still won't pick up." With all of this in mind I am reminded of one of my life long mentors Peter Drucker saying - "it is not the company that makes a profit that rips off society but the one who doesn't." Boy do we have examples to prove this over the past year. In summary, unemployment & the standard of living in a country are functions of the market value of all the socialist programs of the past in that country. This is exactly what we are living with now & it won't be reversed any time soon unless those of us who understand this message participate as best we can to stop BO's economic policies & programs that are intended to shape America to look like Europe for starters.